If the thought of powdery, white sand beaches, colorful coral reefs, sea turtles, and warm turquoise waters excite you, look no further than Indonesia’s new hot spot: The Gili Islands, Lombok. A backpacker hangout that has also becoming increasingly popular with European and Asian travelers, the Gili Islands is an archipelago of three small islands just off the northwest coast of Lombok, Indonesia. 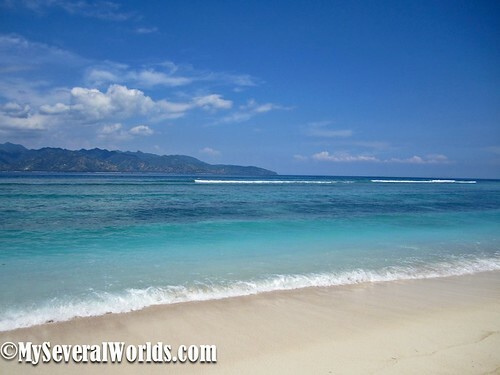 Bali is around 35km to the west of Gili Trawangan, the largest of the three islands. On a clear day, you can see both Bali and Lombok, while Lombok’s active volcano, Mount Rinjani, provides an impressive view in the east. Approximately 1,500 islanders live on Trawangan with most places of business operating from the eastern side of the island. There are plenty of restaurants, clothing shops, and diving schools, as well as a nice range of accommodations to choose from. The economy depends completely on tourism as there isn’t enough land to support agricultural projects on a grand scale. One of the biggest draws for us was the lack of motorized traffic on these islands. No cars, trucks, or vehicles of any kind can be found on the islands. Instead, guests get around on foot, by bike, and cidomo (horse and buggy); the islands are easily navigated. 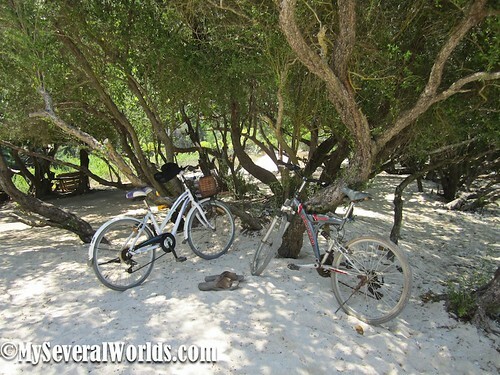 Gili Trawangan, for example, can be traversed in a few hours, or you can circumnavigate the entire island by bike in under an hour – if you don’t run into any sand pits. Beach huts, hotels, and tiny island resorts stretch down the coastlines of these three islands. I was surprised by the quality of accommodations on the islands. Gili Trawangan is home to several mini-resorts that offer luxurious thatched-roofed bungalows with outdoor bathrooms. I’ve written about where we stayed in Gili Trawangan in a different post. There were just too many beautiful pictures to share for one post! As for things to do, I’ve mentioned snorkeling and diving, which are two of the biggest draws in the Gilis. There are a number of scuba diving schools located on the island that offer PADI instruction. The islands’ marine welfare owes a lot to these diving schools. After years of overfishing, the dive schools made a deal with local fishermen to stop fishing around the reef. The area has since been recolonized with reef sharks, parrot fish, pipefish, sea turtles, and sea horses, making the islands one of the nicest areas in Indonesia for snorkeling and diving. There’s lots to see and do in the Gilis. You can charter a boat or go paddle boarding or surfing. There’s a party boat cruise that looked like a lot of fun, and you can take yoga classes, Balinese cooking classes, and silver smithing classes at shops near the harbor. We liked being able to bike around the island and stop at all the little beaches along the way. We had one beach to ourselves for a few hours. It was pretty nice. It felt like we were the only two people in the world. You can live out your tropical dream on these islands. Lounge around on beautiful beaches, gorge on fresh seafood every day, and snorkel through crystal clear waters, or dance the night away in trendy bars and al-fresco restaurants. 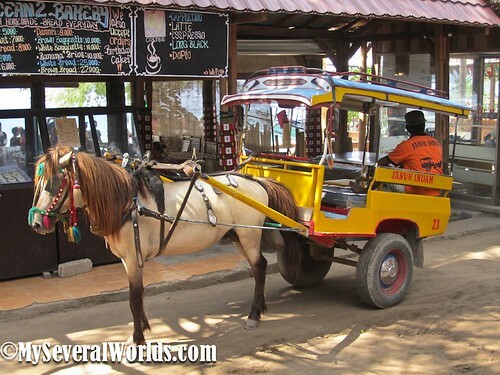 Getting There: You can travel to the Gili Islands by motorized boat and speedboats. We took a fast boat to the Gilis from Padangbai, near Candidasa on the eastern side of Bali. The 16 meter long Ocean Star Express departs for the Gili Islands twice per day every day. Return trip tickets are approximately $100USD, and this price seems to be fixed with most of the boats departing from Padangbai. They stop at Lombok, Gili Air, Gili Meno, and Gili Trawangan before heading back to the harbor area. Our entire journey took about an hour and a half, and it was a pretty nice ride. You can sit down below or ride up top and get some sun. The closest airport is Lombok International Airport. From there, you can grab a fast boat to your island of choice.